If you have read my blog before, you are aware that I LOVE shopping at Aldi. They have a wide variety of products and their prices are great. Last week I was there shopping and was amazed at all the stuff they had that would make it really easy to outfit a college dorm room. 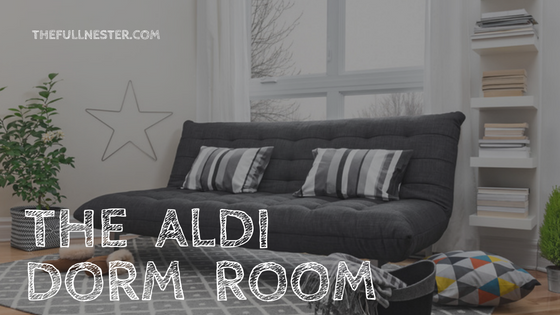 The Aldi dorm room. Who knew? Thankfully we are past having to start from scratch with setting up a dorm room since my daughter will be starting her junior year in college in a few weeks. 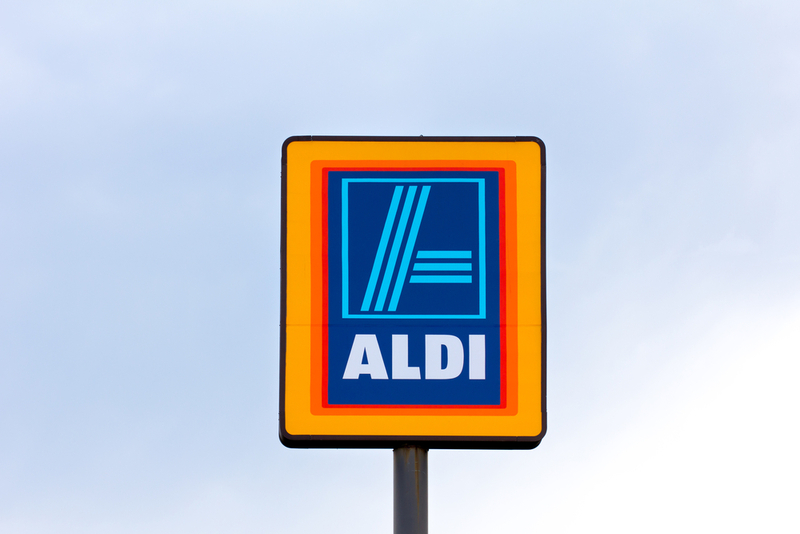 But if we were, take a look at some of the great stuff they have at Aldi! 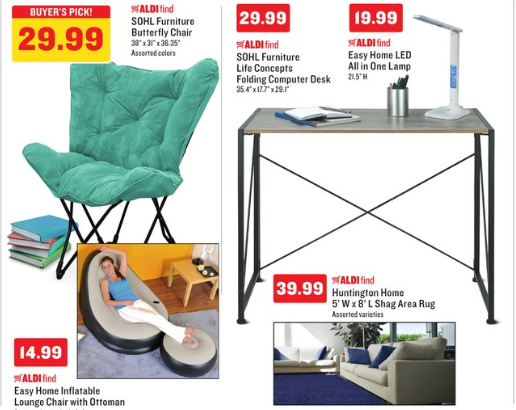 This was last week’s ad, which shows all kinds of cool stuff like a futon, a bean bag chair, a folding tray table and a storage ottoman. Last week, I also saw TV stands that would be great in a dorm room. They could also be used to store a microwave in a small room. 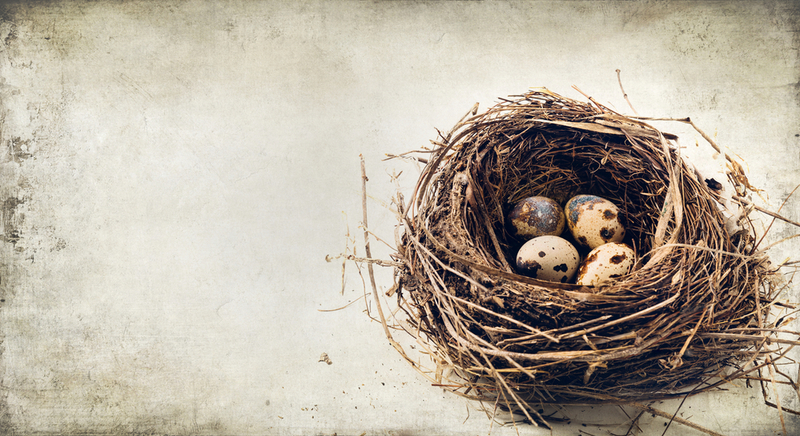 Depending on what you are starting with, these are all great additions to a dorm room. Her freshman year, my daughter lived in a traditional dorm room, where it was just one room that she shared with another girl and they each had a bed, a chest of drawers, a desk and a closet. We bought her a soft saucer chair and a tray table so she could eat in her room if she so chose. This type of dorm usually has a community bathroom, so a shower tote is indispensable. It allows the student to just grab their tote and head straight to the bathroom with all they need in tow. Shampoo, toothpaste, razors, soap, everything in one place. And whatever you do, do NOT forget some shower shoes. You don’t know where that shower floor has been and you want to always wear shoes in the shower. Butterfly chairs, area rugs, inflatable lounge chairs, computer desks. 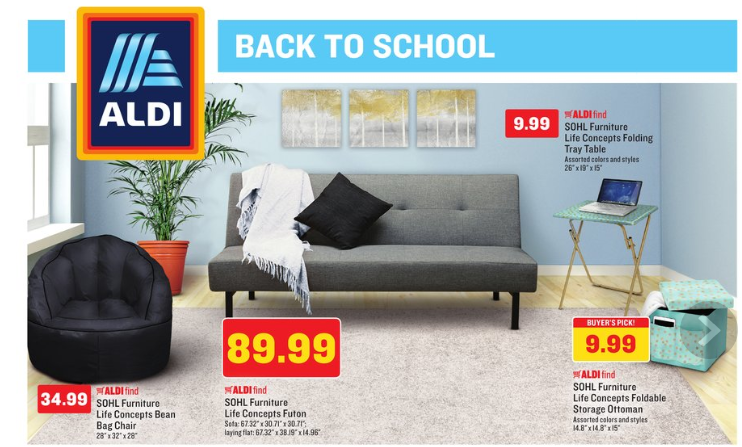 Who knew you could get all this cool dorm stuff at Aldi? 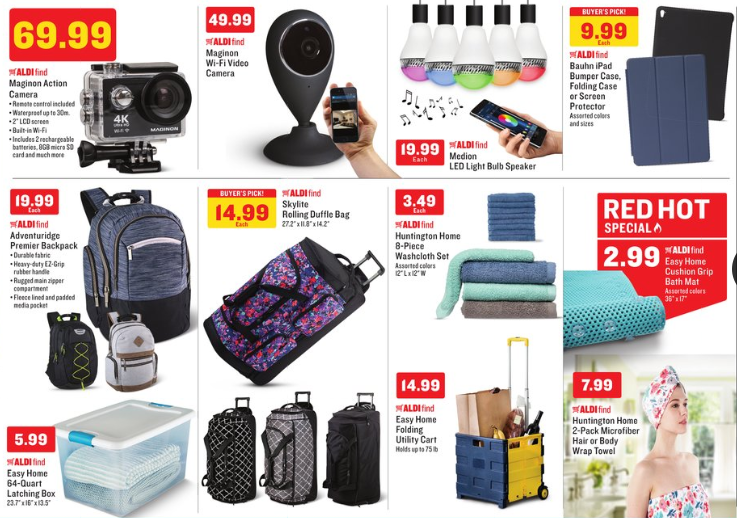 They also have stuff like bulb speakers, backpacks, rolling duffle bags, towel sets, storage boxes, folding utility carts, and iPad cases, all things students might need. 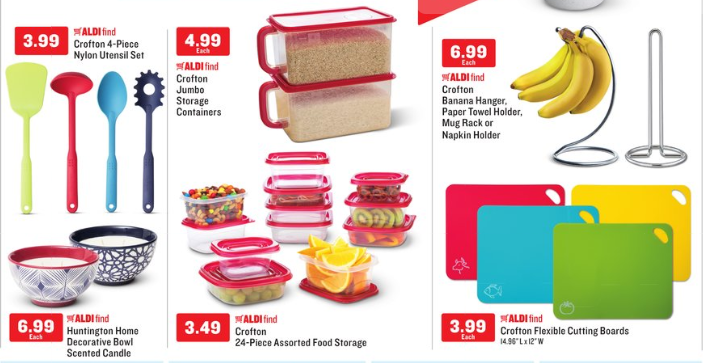 Aldi has a whole section of kitchen items if your student lives in a dorm with a kitchenette. Or even in an off campus apartment. And no crafty person would ever consider dorm room decorating complete without Washi Tape. Just take a look on Pinterest to see how important Washi Tape is to dorm life. 🙂 Aldi has it! My daughter is moving back into the dorm she lived in as a freshman this fall to be an R.A and she will have her own room. When buying bedding for your dorm room, be sure to check the Residential Life website for your college because most of them tell you what size beds are in each dorm. Many are twin bed size, many are twin XL size, and in the case of last year, my daughter’s dorm had full size beds. She will be going back to a twin XL bedding size, so I’m glad we saved all the mattress pads, sheet sets and comforter from her freshman year. All of these items are easily purchased online. 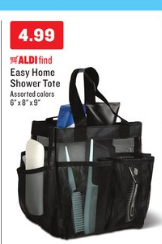 But for basic stuff, look to your local Aldi! 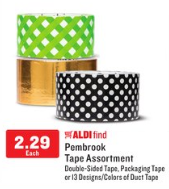 If you see something you like when you’re at Aldi, you should buy it then because they don’t always replenish things that they carry so it might not be there next week. One good thing though, if stuff does sit on the shelves they lower the price each week. So if you’re willing to gamble you might be able to get what you want at a lower price. 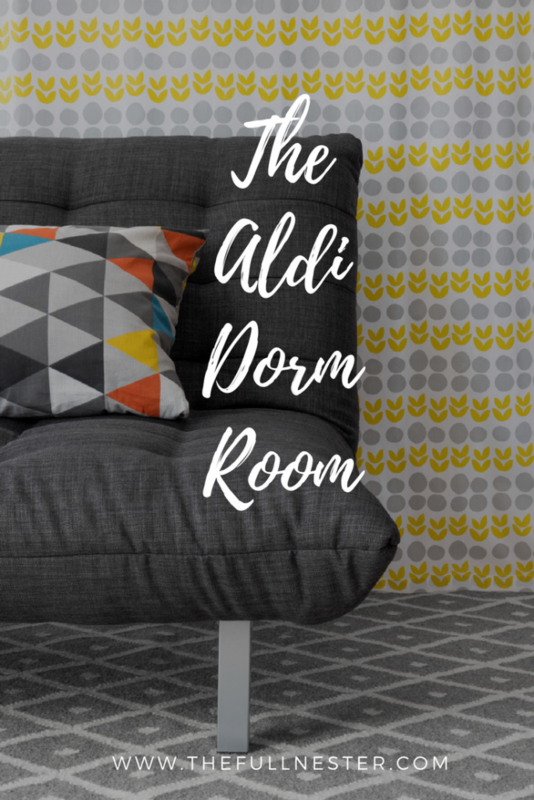 So if you are spending this summer tackling the overwhelming task of outfitting a dorm room, you might want to pay a visit to Aldi. They have more stuff than you know! Every time I go, even if I’m only there for a few food items, I still go up and down every aisle because I am always surprised at the fun stuff I find. We have been through the whole dorm decorating thing and I know how overwhelming it can be. The summer before my daughter’s freshman year, one of our guest rooms looked like a housewares store exploded in there. 🙂 The good thing I can tell you is that it DEFINITELY gets easier every year. You only have to fill in a few items here and there after the freshman year. Let me know if you have any secret places you like to buy stuff for dorm rooms. I’d love to hear about it!